Mormonism, officially known as The Church of Jesus Christ of Latter Day Saints, ranks among the six largest religious bodies in America. While Mormons can be found almost anyplace, “Mormon Country” is defined as the area within a 500-mile radius of Salt Lake City, Utah. Gospel-preaching churches there are rare and usually small. Since 1967 a growing staff of Baptist Mid-Missions missionaries has been challenging the powers of darkness in “Mormon Country.” With personal evangelism and independent Baptist church planting at the heart of every outreach, a variety of ministries has been developed, including door-to-door visitation, evangelistic home Bible studies, intensive discipleship, literature distribution, apprenticeships, children’s and youth work, parades and fair booths, camping, telephone recordings, local church seminars on Mormonism and the Bible, mailings, newspaper promotions, and released-time classes. A distinctive of the Baptist Mid-Missions approach is the emphasis on clear-cut biblical alternatives rather than anti-Mormon argumentation. 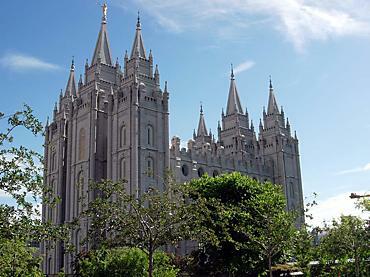 Although typically church growth in Mormon Country is not rapid, classic conversions have occurred. Independent Baptist churches are being established, and many new disciples are now in the ministry on the side of truth, as the Lord has honored the proclamation of His Word. As you ask, “What can I do to promote the cause of Christ in Mormon Country?” contact Steve Butler for helpful information. You can make a difference! Church planting missionaries are needed to further the outreach into Mormon Country. Secular campus missionaries would also be a great asset to the ministry. To find out more about Mormon Ministries visit our missionaries’ website.